Moving from Drupal 7 to WordPress made sense for a business user like Capgemini, freeing up much of the technical overhead and complexity surrounding content publishing and more. 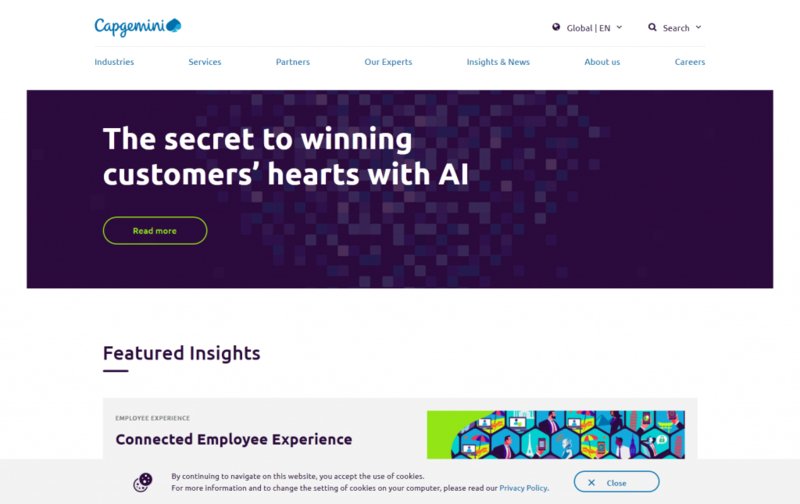 Human Made helped Capgemini enable a new digital culture of creation with a robust, usable, and intuitive CMS to support them in delivering their business objectives and empowering their global network of teams to do their jobs effectively. In 2012, Capgemini launched a series of websites using the Drupal 7 CMS platform. As the organization evolved, the demands on the platform increased significantly and their marketing & communications team experienced blockers at almost every stage of the publishing process. Capgemini realized they outgrew their publishing platform. Because of this, it had become increasingly complex for the both the marketing & communications team and web operations team to manage. Approaching the project, Capgemini had concerns that were centered around investing in a platform that could grow and evolve with their business through any future transitions and periods of growth. They wanted a CMS that had low barriers to entry for their users. This prevents a long and laborious onboarding period for publishers and their web operations team. WordPress ticked the box on almost every front; possessing a native capacity to publish content in a simple, easy-to-use dashboard, while also promoting a user-friendly experience for new users. The first thing the team did was enable editorial users to actually edit, modify, and update content on the website directly. WordPress does this natively — its inherent publishing capacity and the baked-in capabilities it has to facilitate editorial workflows were instantly impactful. This significantly improved the way in-house teams worked. The cost-effectiveness of migrating to WordPress was also a bonus. As a result, many of the publishing challenges Capgemini faced were instantly addressed without any additional need for a bespoke build. Due to its popularity and usability, there was little in the way of a learning curve for the team to start using WordPress, enabling them to make the most of their new platform immediately. It also freed up their development team to tackle more difficult engineering problems and enabled more people across the organization to use and publish content from the site. For business users like Capgemini, and for an organization of their size, WordPress has the capacity to free up much of the technical overhead and complexity surrounding content publishing, allowing content creators, editors, and developers to complete tasks much easier and achieve the results they require faster. By the end of the project, a large portion of the Capgemini network had been moved from Drupal to WordPress, undergoing a complex migration of 38 sites and content syndication across their local and main sites, as well as rebuilding their entire platform architecture. Other highlights include adding 1,400 new users to the platform and publishing over 20,000 pages which have impacted all their websites, spanning over ten languages.